In real estate, the location of a property for sale is a determining factor for buyers, and your knowledge of it is a great way to prove your expertise as a professional real estate broker. Knowing your sector well increases the trust of your prospects and your chances of stand out from the competition. According to a study by the NAR (National Association of Real Estate Agents), the first reason why buyers choose to do business with a certain real estate broker is his knowledge of the neighbourhood, city or region where they want to settle. Marketing-wise, not describing the neighbourhood of a property for sale is a mistake you can’t afford, but an easy one to avoid. Urbanimmersive offers a story-writing service on any topic related to real estate, including portraits of neighbourhoods where you are active, such as this one. A real estate blog content article that describes the property’s cityscape will help improving the rankings of your website on search engines: Basically, it’s a formidable asset for a content marketing campaign! Why Exactly Should You Take the Time to Describe Your Listing’s Neighbourhood? With your help, Urbanimmersive’s editors can identify the target clientele of a property for sale and highlight it accordingly. For example, if the property is more likely to attract a young family, the article will mention neighbouring schools and parks, for example. If, on the contrary, focus should be on retirees, the article will insist on the area’s grocery stores and public services. This infographic on what to highlight according to your target clientele will help directing your content marketing campaign. That said, regardless of your target audience, a neighbourhood portrait will always address as many aspects of the urban landscape of the house for sale as possible. Each “urban measure,” even the most obvious, such as easy access to highways, must be in the foreground. Search engines like Google love fresh content. If you fail to feed or update your blog regularly, you will quickly end on the last result page. For that reason, it’s better to describe the cityscape of each new listing. Which Urban Measures Should Be Outlined in a Neighbourhood Profile? This means to mention nearby academic institutions such as elementary schools, high schools, CEGEPs, universities or any specialized school, as well as daycares. This urban measure indicates how easy it is to get around by way of public transit (bus, subway, commuter train, et cetera). To attract even more prospects, our editors could even include the train schedule in direction of Montreal, for example! The train station located near the property for sale has a 600-lot parking space? Mention it to those in charge of writing your article! This is exactly the kind of details that potential buyers want to know! It is also necessary to mention how easy (or difficult) it will be for future owners to access the main roads… and, of course, talk about traffic. Some buyers want to be near highways, and others want to get away from them. In addition, if your prospects are young professionals, the proximity of an airport could be a great advantage. There is no “bad” information when it comes to transportation. Be transparent to your editor and they will make sure to highlight everything positive about your listing’s location. This is where we describe which businesses and public services make the area appealing. Depending on your property for sale’s target clientele, Urbanimmersive’s team of writers will examine the neighbourhood with a fine-tooth comb to identify the best restaurants, bars, cafes, and shops. Even if they are a little less glamorous, grocery stores have to be mentioned too: After all, they are the shops that we visit the most regularly! In terms of public services, Urbanimmersive’s editors know the value of parks, bike paths and bike-sharing stations like BIXI. Pet owners are not left out. If dog parks are located near the house for sale, it is definitely worth mentioning. Some buyers will be delighted by the idea of letting their pet run in a fenced yard while they socialize with other dog lovers! It feels good to sleep the windows open during summer… In a neighbourhood profile, the noise level cannot be overlooked, especially if the area is quiet. If, on the opposite, your listing it located in a loud neighbourhood, you may be hesitant to address this issue… but don’t! Some prospects like to be in the heat of the action and “hear” the city. Once again, there is no right or wrong when it comes to urban measures. It is up to the editor to describe the noise level honestly, but in the most positive way possible. By being honest, you will effectively filter prospects and maximize your chances of finding the right buyer without spending too much time with others. Simply take a look at newspapers to fully understand how important this urban measure is! Here is an article about the complaints of the residents of Saint-Lambert, on the South Shore of Montreal. There are many other urban measures, such as access to waterways or pedestrian trails in the mountains. 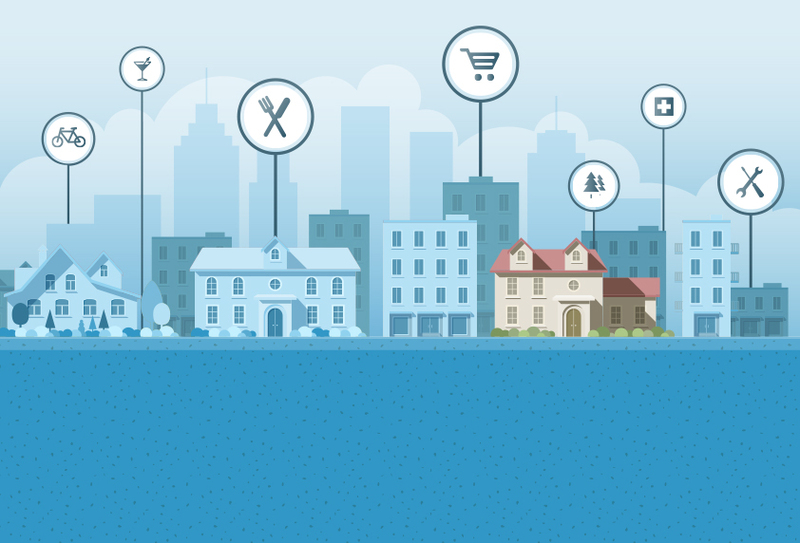 A blog article that includes all urban measures will draw an appealing profile of the neighbourhood that will be part of a successful content marketing strategy. Any neighbourhood portrait is written with popular keywords that ensure good indexation in search engines. Our editors regularly verify which words are the most popular with search engines to guarantee that each article you order gets the most exposure possible. For example, instead of using “pedestrian road” to identify a walking trail, they may choose the term “bike path,” even if the idea is to describe the perfect track for a peaceful walk in nature. One more thing: Exclusive photos highlighting important aspects of the cityscape, such as parks or schools, will give your article an even better position in search engines and more social media exposure. Ask your real estate photographer to snap a few pictures of the cityscape!